Born in the Kingdom of Mercia to a family of thieves, Mighty and his younger sister were too young to realize the actions of his parents, "oblivious in [their] innocence" as Mammoth Mogul put it. After his parents were subsequently sent to prison for their crimes, Mighty sought a method to free them. Discovered by Mammoth Mogul, the ancient Mobian granted Mighty his tremendous strength. Even with his new powers, Mighty failed to rescue his parents however, and imposed exile on himself. While wandering Mobius in exile, Mighty was captured by Dr. Ivo Robotnik along with Fiona Fox, Ray the Squirrel and other Mobians. Taken to a forced labor camp, the captured Mobians were to be used as experiments to create the first Auto Automatons. The camp was infiltrated by a young Sonic the Hedgehog, who helped the captives cause an uprising and escape. During the uprising, Mighty and the others were forced to leave behind Fiona and Ray. Following his escape he wandered for many years before choosing the Angel Island as his new home. The guilt of abandoning Ray followed him even far away from the containment facility. Shortly after his escape from the prison complex, Mighty continued to wander the lands searching for a place to call home and soon encountered Knuckles the Echidna for the first time. Attempting to explain to the Echidna terms like "slave labor", "prison camp" and "lab rat", Mighty eventually found himself confused when Knuckles tried to explain what a crocodile was, as he was hoping to find Vector. After the two realized they both had something in common, each having lost their parents, Knuckles offered Mighty the chance to accompany him and Vector back to the Floating Island, which Mighty accepted. Mighty began his new life on the island where he was finally able to live in peace. However his peacefull life was disrupted when Renfield T. Rodent and Dr. Ivo Robotnik set up a base of operations on the island disguised as a carnival. 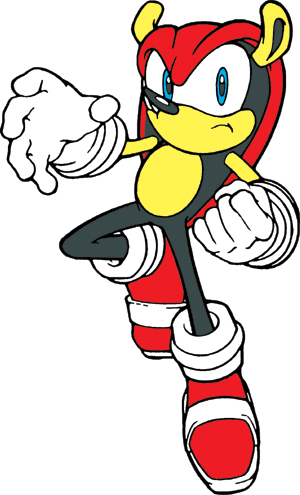 Mighty was enlisted by Knuckles along with Vector, Espio the Chameleon and Charmy Bee to help him force Robotnik off the island. After Robotnik's defeat, Mighty joined the newly formed group, the Chaotix. After the demise of Ivo Robotnik, Mighty was confronted by Fiona Fox to undertake a mission. Fiona and Nic the Weasel had teamed up to returned the the containment facility where Mighty, Ray, Fiona, and Sonic had been imprisoned many years before. Nic and Fiona wanted to return to the facility to raid its power source, a magical gem similar to the Chaos Emeralds. Mighty was contacted to demolish the powerfully armored door that sealed the gem in place. After breaking into the abandoned facility Mighty easily destroyed the door. To Mighty's delight, they discovered Ray clinging to the gem. Apparently after the facilities closing, Ray was unable to escape the facility unlike Fiona. Ray discovered the power source room and clung to the gem. The magical properties of the gem allowed Ray to live for years without food or water. Despite herself and in a rare moment of compassion, Nic destroyed the power gem to free Ray. The bounty hunters left Mighty and Ray behind to catch up. Mighty then promised he would always look after and protect Ray to make up for having to leave him behind in the facility many years ago. Following Sonic's year-long disappearance, Mighty accompanied the Chaotix during their raid on Angel Island to liberate a Dingo-run concentration camp and rescue Knuckles' father Locke from captivity. Following this, Might and the others returned to Knothole where they would remain for some time. Mighty was with the rest of the Chaotix in Knothole when the Egg Fleet attacked and destroyed the city. Enraged at the sight of Ray being captured by Snively, Mighty nearly killed Snively, destroying a key part of Snively's attack mech. However, Mighty, like the vast majority of Knothole's citizens, was transported to the Egg Grape Chambers in New Megaopolis. However, he along with everyone else was freed and transported to New Mobotropolis. Mighty remained in New Mobotropolis with the rest of the Chaotix during the Enerjak crisis, though when Julie-Su wanted to leave the city and see if Knuckles was okay, Mighty readily assisted her and the rest of the Chaotix in attacking the city's airfield. However, when Sonic and Tails were dispatched to Angel Island instead, the Chaotix remained in the city. 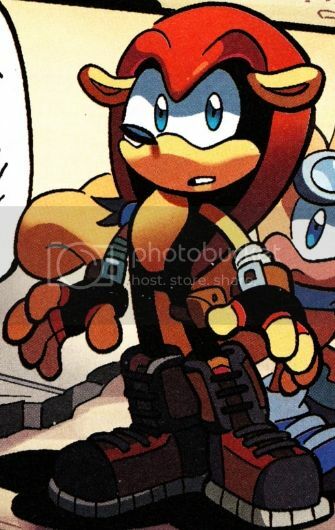 Shortly after the Enerjak crisis was resolved, Mighty remained in behind to help rebuild Freedom HQ while the other Chaotix members went to Angel Island to comfort Knuckles. During this time, Mighty was mind controlled by Mammoth Mogul who still had a magical hold over him since he gave Mighty his strength as a child. Mogul controlled Mighty like a puppet, along with Tails, and Mina Mongoose to force Sonic to give him a Chaos Emerald from the Special Zone. After Sonic complied, Mogul released Mighty from his spell. The spells lingering effects were completely erased by Merlin Prower and Mogul controlled him no more with Mighty still possessing his strength. Following this, Mighty and the rest of the Chaotix launched an assault on New Mobotropolis to take out the Dark Egg Legion and destroy one of Dr. Eggman's communications relays.